Insulating the roof is a smart choice: it will save a lot of energy, which is interesting both from a financial and ecological viewpoint. In this article, you can discover the different types of roof insulation and their advantages and disadvantages. Insulation wool is primarily suited for the insulation of pitched roofs. It is available in the shape of rolls or semi-soft panels. The wool can easily be cut to size and as it is compressible, one can install it between the rafters without any tools. There are three frequently-used types of insulation wool: glass wool (fibreglass insulation), rock wool and sheep’s wool. Glass wool belongs to the inorganic insulation materials. It is made from recycled glass that is melted under high temperature. During the cooling process, one draws thin glass threads from the melted glass. Afterwards, one adds a few additives. As a result of this, the glass wool is formed. Because of its light structure, glass wool can hold a lot of air and it has excellent insulating properties. Take into account however, that glass wool causes skin irritation. It is therefore advised to wear protective gloves when using this material. Just like glass wool, rock wool belongs to the category of inorganic insulation materials. It is made of melted volcanic rock that is spun into thin glassy threads. Oils and resins are added to the thin threads in order to make the material waterproof. The properties of rock wool are similar to those of glass wool. Rock wool is less irritating to skin than glass wool. 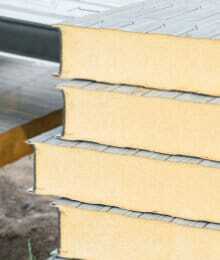 However, rock wool may produce dust during cutting, which may lead to irritation on the lungs. It is therefore definitely advisable to wear a face mask when applying the rock wool. Sheep’s wool is perfectly suited for roof insulation. It is an environmentally friendly alternative to glass wool and rock wool. Sheep’s wool is slightly more expensive, but in return you get an ecological material that is pleasant and easy to work with. Since this material does not cause irritation to skin or lungs, there is no need to work with gloves or dust caps. Sheep’s wool has got good moisturizing features, as well as a high heat storage capacity. Consequently, the house will remain pleasantly cool during summer. Are you looking for an insulation specialist to insulate your roof? Via our quote service, you can request non-binding price offers from experts for free. Click here for more information. Insulation boards are, on a general note, stiff panels made of plastic foams. They are very light, easy to saw to size and they have a high insulation value (even in case of a small layer thickness). As the boards are damp-proof, they can be applied on both the in- and outside of flat and pitched roofs. 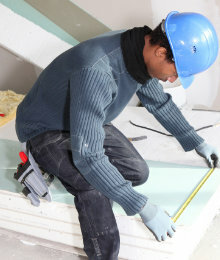 PUR, PIR and XPS are the most widely used types of insulation boards. PUR (polyurethane) insulation boards are very easy to customise. It is simple to attach them between or onto the rafters. These roof insulation boards are available in several finishes. Some of them are already provided with a finish (like gypsum board), which speeds up the insulation process of the roof. PUR insulates very well, even when the layer thickness is rather small. 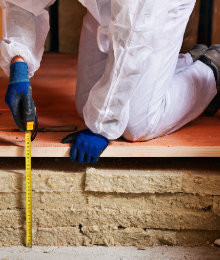 Gaps can be filled with PUR foam in order to achieve optimal insulation. PIR (polyisocyanurate) insulation boards are comparible to PUR when it comes to their appearance and processing method. However, PIR boards are considered to be more fireproof, solid and pressure-resistant than PUR. If we compare PIR & PUR boards with equal thicknesses, PIR has a slightly better insulation value. This material can be used for many insulation applications. As it does not absorb damp, PIR roof insulation performs well in damp conditions as well. This type of insulation board is very resistant to pressure and protected against damp. This is why they are regularly used to insulate flat roofs (roof sarking or inverted roof). In case of an inverted roof, XPS boards (extruded polystyrene) often function as insulation materials. On top of this comes a layer of gravel or tiles. XPS roof insulation boards are easy to process as well. This implies that the insulation work will progress quickly, which has a positive effect on the installation costs. Do you want to have your roof insulated by a craftsman? Receive noncommittal customised quotes for free. 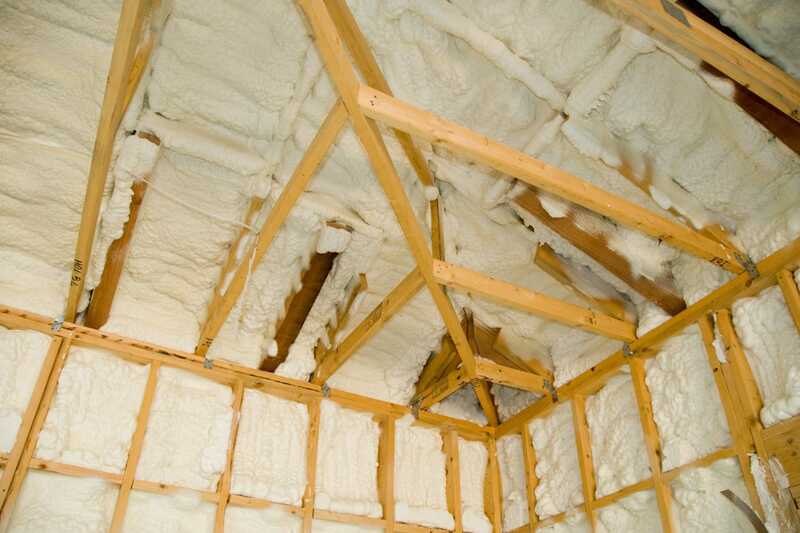 Next to board material or insulation batts, it is also possible to insulate the roof with loose-fill insulation materials that are blown or sprayed into the roof. The advantage here is that the roof construction gets filled entirely and that thermal bridges are avoided. Frequently used examples of this type of roof insulation are: polyurethane foam, cellulose insulation and sprayed glass wool. PUR foam has an excellent insulation value. The biggest advantage of PUR foam is that it perfectly seals all seams and gaps in the roof, so you won’t have to deal with thermal bridges. A disadvantage however, is the temporary odour nuisance after application. This odour is comparable to a strong odour of paint. Another disadvantage has to do with the fact that PUR sticks to all building materials. You won’t be able to reuse these materials in the future. Insulating the roof with cellulose is another common and ecological way of insulating. The cellulose fibres are made out of recycled newsprint and blown into the roof. In order to apply the cellulose smoothly and quickly, one often wets the flakes with a natural adhesive. 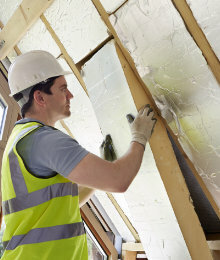 In case of a pitched roof, the vapour barrier makes sure the fibres remain perfectly in place. Finally, one often uses blown-in glass wool for the insulation of cavity walls. It is also suitable to insulate pitched roofs. Especially in the case of roof renovation, it can be attractive to insulate the roof with blown-in fibreglass. This white insulation wool is blown into the roof dryly: all the seams and gaps are filled properly. The glass wool is recyclable and it won’t stick to the construction materials. 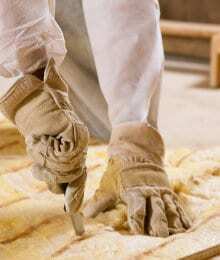 First and foremost, the price for the installation of insulation strongly depends on the choice of material. Also the total surface, the thickness of the insulation material, the roof type (pitched or flat) and the level of difficulty are elements that will determine the costs. Do you consider to have a pitched roof insulated with glass wool? Prices for this start at approximately £20 per square metre. Take into account that the costs may increase when you choose another material. There are different ways to earn back your investment faster. Check, for example, whether you qualify for roof insulation grants. Do you want to insulate your roof and rely upon a professional? Via our online quote service, you can request customised prices from insulation experts for free. Click here for more information.